One of the top air compressors on my review list was the BOSTITCH CAP1512-OF 1.2 Gallon Oil Free Air Compressor. This little compressor is able to cover a lot of ground in terms of application. Whether it’s used by professionals, hobbyists, DIY enthusiasts, or complete amateurs this little beast is more than capable of rising to the challenge. One thing you should always be on the lookout for as far as air compressors are concerned is the name of the manufacturer and its reputation. Stanley-Bostitch is a well-known name in the industry, famous for its power tools and pneumatic equipment since 1896 which means you’re spending money on a quality product. You can attach just about any power tool to it, so it’s possible to use this compressor for air cleaning, spray painting, tire inflation, and just about anything else you can think of. This particular model has an engine that puts out 2.0hp (peak) or 1.5hp (running). It’s able to deliver 2.8 CFM at 90 PSI with a maximum pressure of 150 PSI. I have to point out the low amp draw of the device which is only 12 amps. This means the unit is highly resistant to voltage drops and it will start up easily without tripping circuit breakers. The design of this particular compressor puts it among the most compact units I have reviewed on my website. With a 1.3-gallon tank and weighing only 23.5lbs, you can transport this little guy just about anywhere without thinking twice about it. Another great feature is the roll cage which is there to protect the gauges. It’s a great unit for trim work and its engine is more than capable of completing any task. 1.2-gallon’s is on the small side, but you won’t notice that given the PSI and CFM mentioned above. Most power tools require far less pressure than that, so you don’t have to worry about having a sufficient amount of power with this compact beast. Portability is important to many and this one is just that – portable! The unit’s size makes it ideal for use in cramped spaces, and it’s lightweight enough to make frequent transportation a breeze. Really, any adult person can pick it up and carry it without much effort, and it can be tucked away in just about any space. Compact compressors tend to be designed with maximum convenience in mind. Portability and low maintenance are the things to look out for. This unit has portability down pat, and since it has an oil-free pump there is no need to change it in order for the machine to run. This will save you some time and hassle, and you won’t make a mess in the process. These compressors are also suitable for use in cold weather. Now, I have to be honest and say that oil-lubricated compressors are better for heavy-duty use, but since this one has a different purpose the choice of an oil-free pump is the right way to go. Small compressors like this tend to be deceptively safe, but you have to remember this is a powerful tool and you need to be extremely careful when you use it. That’s why it has a number of safety features to help prevent you from being harmed. It has a safety valve, which is there to relieve the pressure that builds up inside the tank. Also,( and you won’t find this mentioned much anywhere else) compressors have a tendency to get pretty hot, but this one reduces the risk of burns by keeping all the components like the tube and the cylinder head out of direct reach. The manufacturer has even added some sheathing for the same purpose. 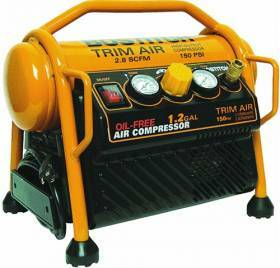 This air compressor is a great for trim and finish work which is mirrored in its compact dimensions and low weight. While not fit for heavy-duty use, it is perfect for inflation tasks, painting, and cleaning. Despite its miniature stature its motor is very powerful, and the pressure it can deliver puts it at the top of its class. There is much to like about this model, so if you’re a handyman, a DIY enthusiast, or a hobbyist, do yourself a favor and grab one of these on Amazon today.